Lipscomb University’s campus appears environmentally conscious, with recycling receptacles located adjacent to most trash cans in The Square. 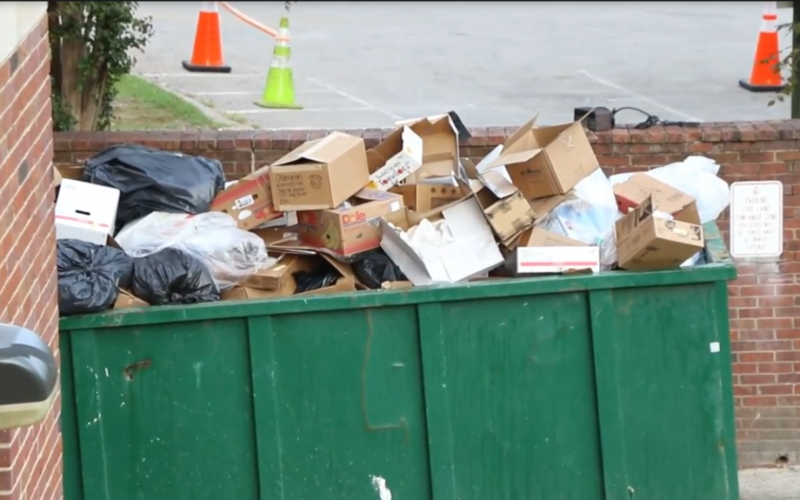 However, in 2016, Lipscomb’s Student Government Association decided that there were better uses for student funds than large-scale recycling options on campus. Yet, student interest was proven last spring when now-senior Lauren Borders helped host a recycling event. “We put together this event to get people talking and to prove to administration that recycling was something that could be done on Lipscomb’s campus,” she said. The event collected 189 pounds of recyclables from students, who took the load to a nearby facility. Dr. Josh Roberts, Dean of Student Development spoke of the school’s past recycling efforts. “We used to operate a large-scale recycling initiative through Earth Savers, and that was funded through $15-20,000 a year from a subsidy that SGA provided,” Roberts said. Student body president Sierra Sparks elaborated on why SGA chose to use their funds elsewhere. The $15,000 spent on recycling could take up over half of the SGA budget, depending on the year. “Don’t get me wrong, I think recycling is very important… But sometimes it’s okay to say that that’s not what SGA does,” Sparks said. As far as the future of sustainability on campus is concerned, Borders is hopeful. “There is a possibility that there could be some administration shifts toward more environmental policies, and there is a new SGA proposal in the works,” she said. “Service operations does everything that they can, within their means, to try to [be] environmentally conscious with trash and debris,” Roberts said, adding that many offices that go through large quantities of copy paper recycle the waste on a smaller scale. If you are concerned about your carbon footprint and are looking for recycling opportunities, you can take your recyclable debris to the back of Hillsboro High School, located on Hillmont Drive. The facility has different bins for various materials, including a Goodwill drop-off area for gently-used clothes and furniture. I graduated this past May, and this occurred during my first of two years on SGA. While it was a bad look for SGA, it wasn’t a matter of the senate deciding that recycling wasn’t important. As reported in the article, the cost of the recycling program accounted for a large portion of the proposal budget that was intended to fund students in various philanthropic, spiritual, academic, and/or cultural events/initiatives. While recycling is incredibly important, the cost of the program became prohibitive in our ability to use the proposal budget as intended. We (including SGA sponsor, Josh Roberts) made it as clear as possible to administration that we believed recycling was important enough to the school and community that the university itself should be funding it instead of passing it off on the student funds that comprise SGA’s proposal budget. Unfortunately, the university has yet to step up to the plate and allocate money for this.